Working on the fifth section, I encountered two more challenges. 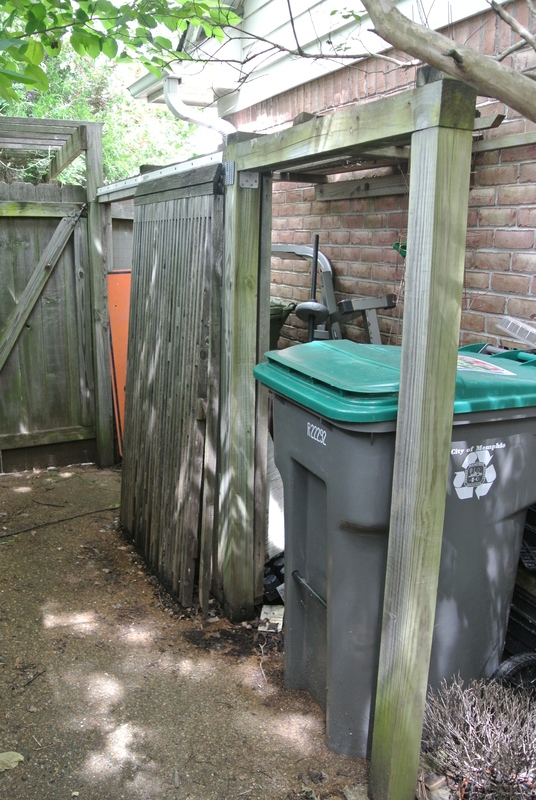 …before the small gate section could be removed. 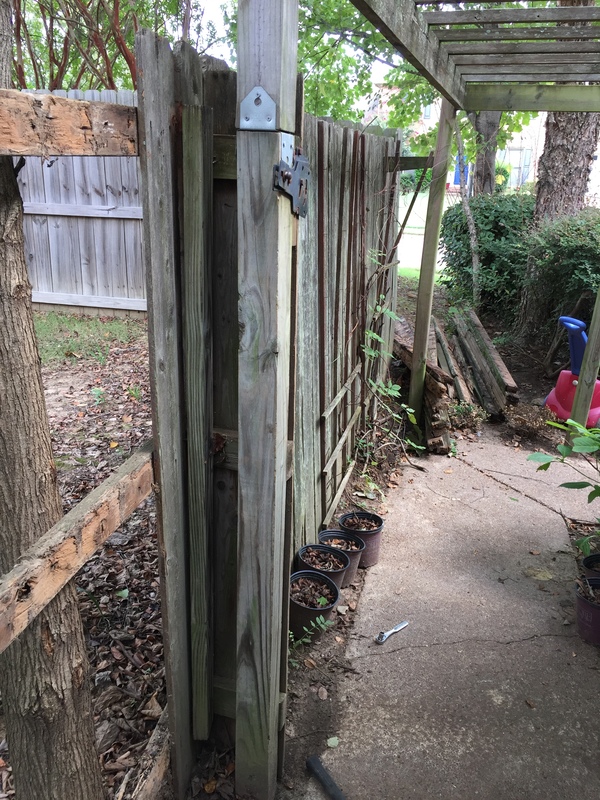 I planned to reuse the gate so when I pulled these boards off, I had to be careful not to split or damage the fence boards. I was relieved once I successfully completed this step. When I went to install my cross beams, I ran into my next challenge. This tree was apparently not there when the fence was built but over the years, this volunteer apparently took root and grew up right next to the fence. 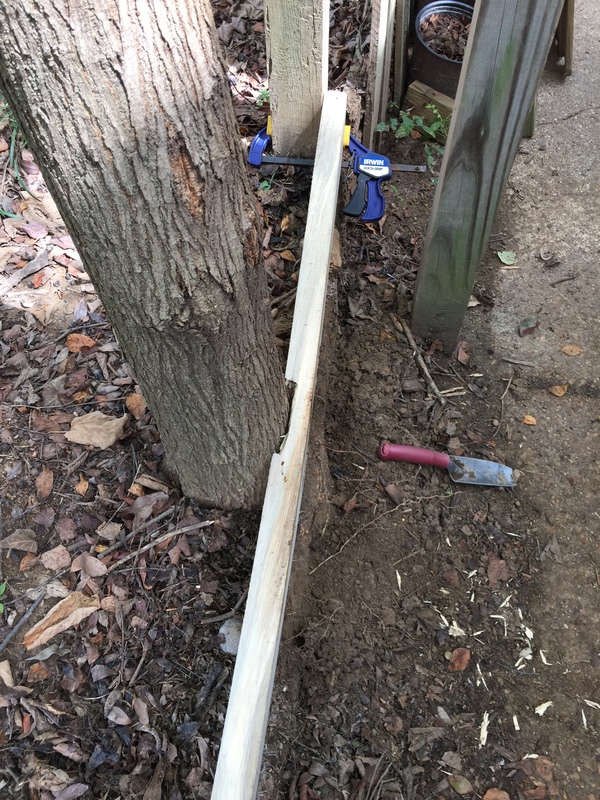 When I went to install the bottom cross beam, it wouldn’t mate to the post because of the width of the trunk. 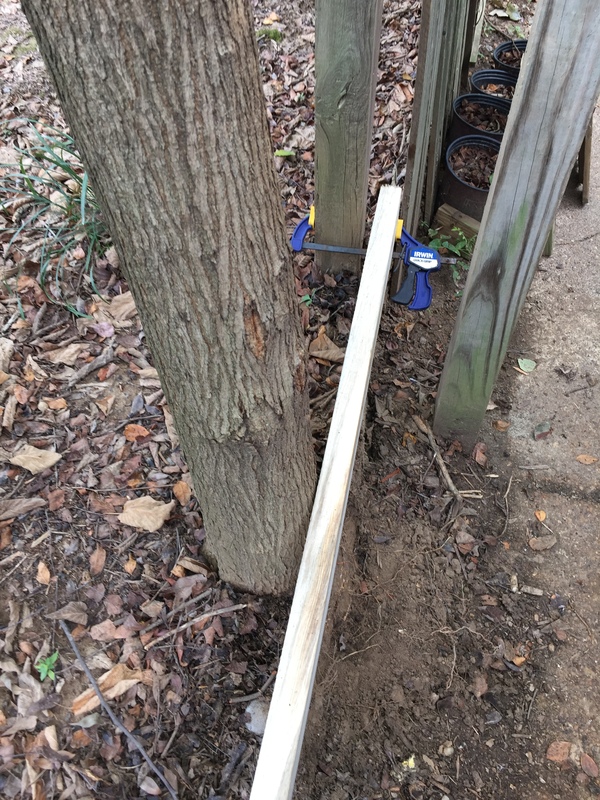 I pondered my different options for a while and finally decided not to pull a George Washington and chop down the tree but rather to notch my crossbeam. This took some time with a hammer and chisel since having to repeatedly trial fit and then chisel some more. I finally got it notched well enough that the crossbeam did not have to bow too much to be nailed into the post. 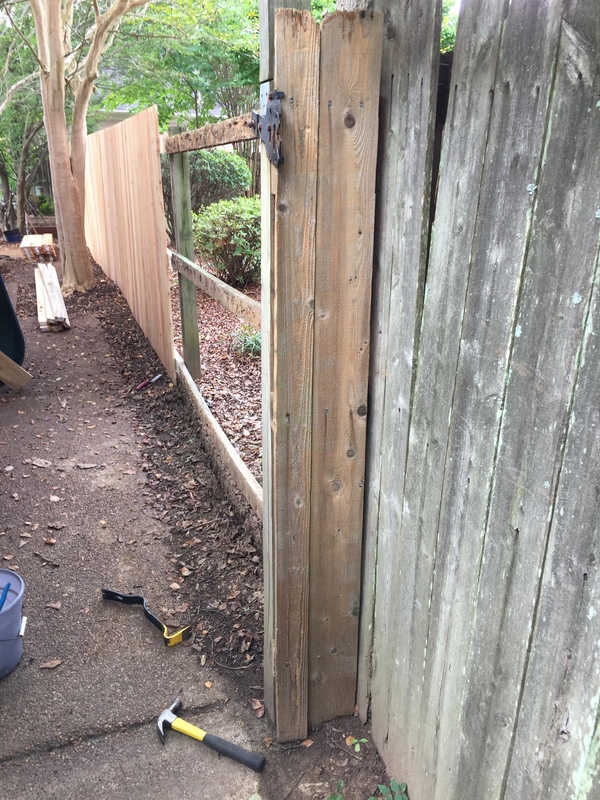 Once I got all the fence sections attached and went to reinstall the gate, I found that the gap between the gate and the new fence was now larger than before, apparently due to me notching the crossbeam. But then I remembered that badly warped board which turned out to be bowed in just the right direction to close that gap. 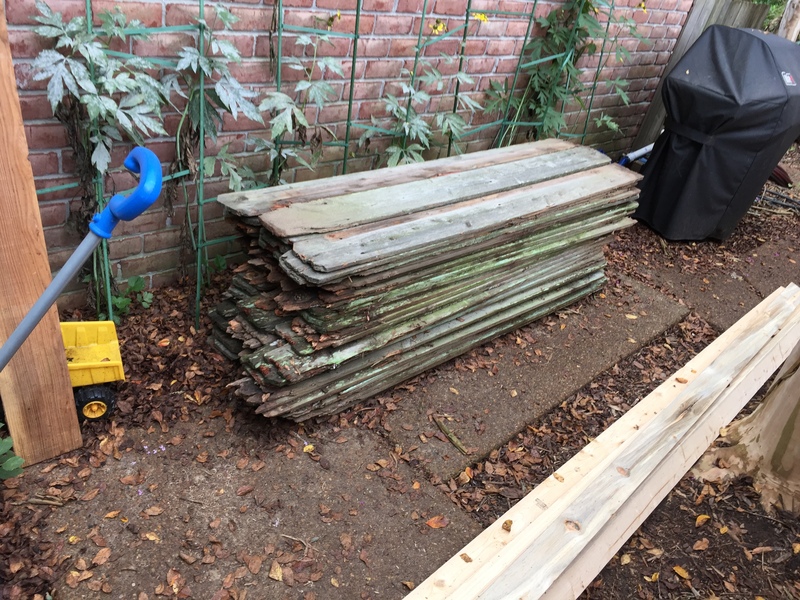 All the while I had been taking down the fence, I had been piling up the old rotted boards not sure how I would get rid of them. It just so happened that day we were having the wooden floor replaced in our bedroom (a long story for another day) and when one of the workers came outside to admire my work, he asked me what I was going to do with the old wood (he even asked me if I installed fences for a living). I told him I was just going to throw them all away to which he replied he’d be happy to haul it off with our old bedroom floor as well. Problem solved! When I got to the eighth and final section, I really felt like I was in the home stretch and optimistic that I would finish the fence before I headed out of town. 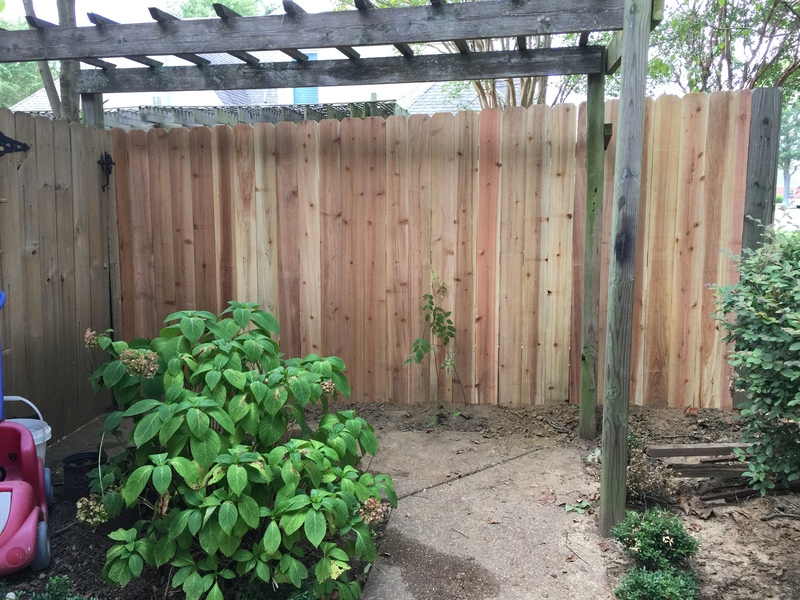 As I removed the old fence boards, I saw that my neighbor’s yard had increased in elevation about eight inches over the 20+ years my fence had been in place. 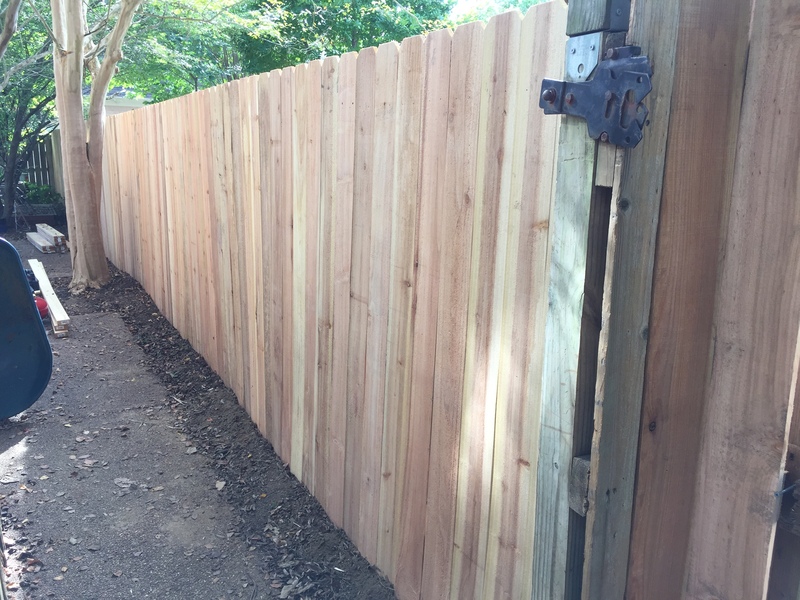 When my neighbor had their fence replaced, which mated to my old one at the front corner, it had been installed at this new higher elevation, which meant at the corner of our property, their fence was about eight inches taller than mine. I considered several options and in the end decided to run a string from the top of my last fence section by the gate to the top of their fence achieving a slight increase in fence height over the 10 foot section (seen at the top of the photo below). This went well but then another problem arose. When I took down this last section, I found that there was actually another short section about 24 inches long that I didn’t realize was there. I had not accounted for this in my crossbeams purchase but fortunately I had enough old 2 X 4s lying around the house that I could use. 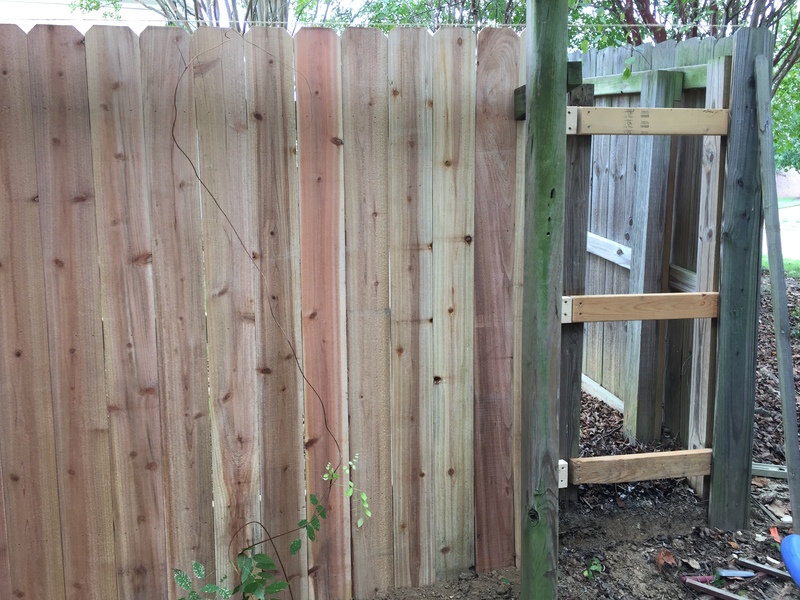 But somehow it made my fence board counts off as well and so back to Lowe’s I went for a few more boards. An hour later I was finally done! 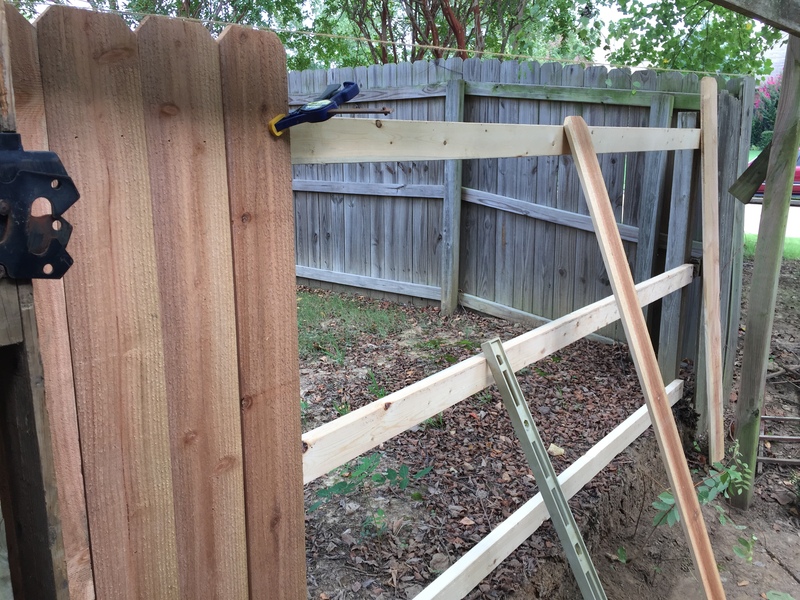 As I gathered my tools to put them away, I felt a deep sense of accomplishment to see the finished fence. 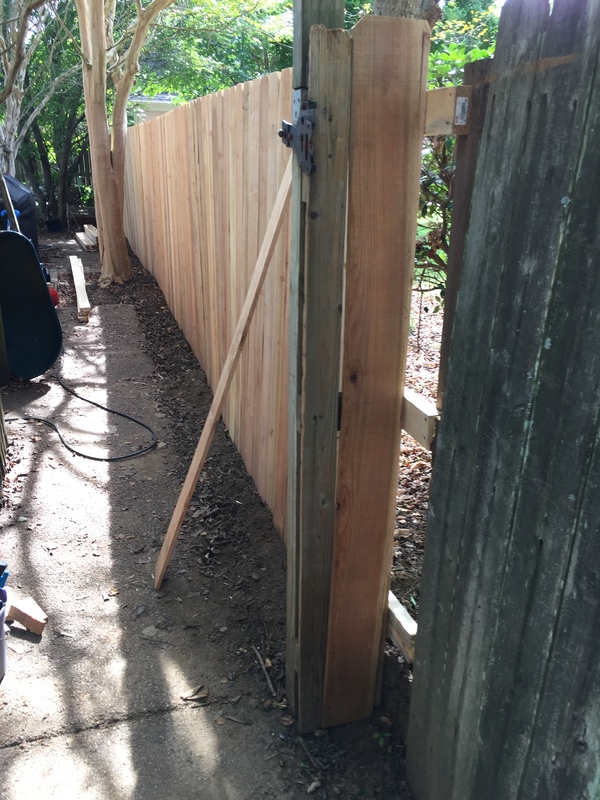 Overall, it took me a total of eight days to complete the fence with untold numbers of trips to Lowe’s (with loads of boards precariously sticking out of the back of my wife’s Outback). I had fun rebuilding it and I really enjoyed using my new nail gun. 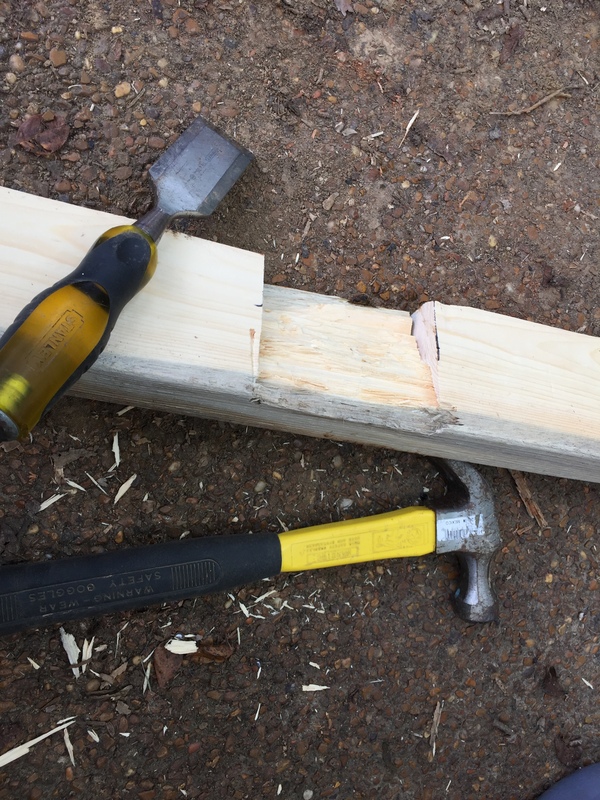 I breathed a huge sigh of relief when I struck that task off my “To Do” list but seeing rebuilding my garbage blind still on that list, I knew I was in for even more fun with that new nail gun! Previous Previous post: Re-Fence or Defense? Or Snatching Victory from Defeat? Next Next post: A Stick? Or Not. 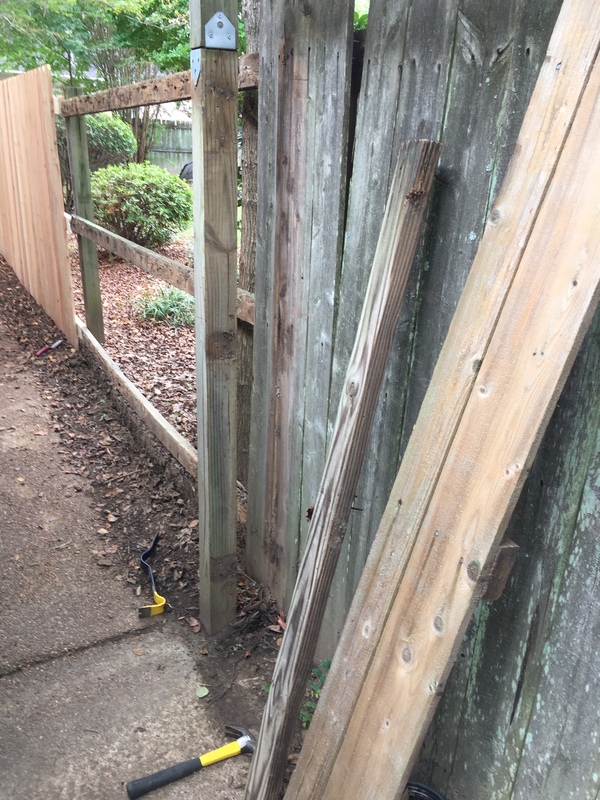 I cannot wait to see this new fence! I cannot imagine doing something like this. Maybe I should try a small project! Good job Dave! Thanks, made all the easier with the nail gun. onecreativescientist Re-Fence or Defense? Yes, Victory!